Fr. Spiridon Vandoros was born on September 3, 1959 in Patras, Greece. He attended elementary and high school in Patras. He moved to Athens for his theological training at Rizarios Anothera Ieratiki Scholi for 2 years and Athena Anothera Ieratiki Scholi for 2 more years. After graduation, he continued his theological studies at the School of Theology, Thessaloniki Aristotelian University for another 4 years. In July 1987, he married Presvitera Hariklia Stergiopoulou. In November 1987 he was ordained priest and appointed to The Annunciation of the Theotokos Orthodox Church in Quebec City. 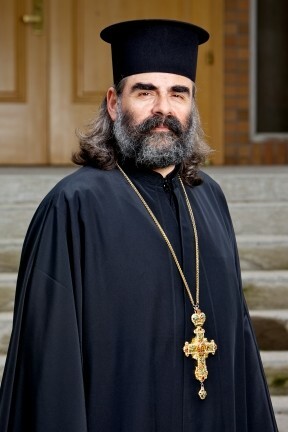 After 3 years, in January 1991, he was transferred to Holy Trinity Orthodox Church in Toronto. In August 1993, he moved to St. Paul’s Greek Orthodox Church in Regina, where he currently serves the communities of Regina, Swift Current, Yorkton, and all of the south Saskatchewan area. On September 11, 2011 he was granted the rank of Protopresbyter (Protopresviterios), the hightest honour bestowed on a married priest in the Orthodox Church. Axios! Between 1961 and 1966 a number of priest would come to Regina from other provinces and from the United States to perform Church services. They are Fr. Michael Makridis, Fr. Vasilios Roumadas from Minot, ND, Fr. Pavlos Koutoukas, Fr. Pateleimon Fatsos and Fr. Eleftheriou. The first permanent priest for St. Paul’s Greek Orthodox Community was Fr. Panagiotis Sbilis serving from July 15, 1966 until January 15, 1968. Fr. Basileios (Basil) Stamatopoulos, or Fr. Stamas as he was known to his parishioners, followed as our priest from 1968 until 1974. Fr. Nicolas P. Andreou served St. Paul’s Greek Orthodox Community of Regina from 1974 until 1993.